What can be more important for a future bride than the choice of a wedding dress? Only the choice of a wedding hairstyle! On the big day any bride wants to be beautiful, stylish, stunning and look so in the wedding photos. An idea of a wedding hairstyle as of something voluminous, lacquered and adorned with a wedding veil, is just a stereotype. If you are used to wearing a stylish short haircut, that doesn’t mean you’ll fail to fit into a standard image of a bride. Wedding fashion tendencies change to a greater or lesser degree every year. Thus, contemporary short hairstyles amaze us with a plenty of interesting ideas. Let us share with you 40 pictures with stunning examples of the latest bridal hairstyles for short hair. Generally, modern wedding short hairstyles are pretty simple, without unnecessary excesses. The less styling products your hairdresser is going to use, the more fashionable you will look in the coming season. If your length affords to make an updo, it should be rather loose and natural-looking. Short hair welcomes such focal points as stately hair accessories (tiaras, wedding headbands, combs, bobby pins, hair clips, etc.) They can mach the color of your wedding gown or serve a contrasting detail. Bridal hairstyles for short hair can also imitate long hairstyles, for example, if you have your bangs and front tresses styled backwards with the back of your head covered by a wedding veil or a compact floral composition. Short bob haircuts even offer a great opportunity to make breathtaking wedding updos which you’d never believe are made on the basis of such a critically short length! Let’s better see all that in the photos below. The low messy updo will compliment your rustic bridal attire. Such a cute chignon hairdo can be accomplished with artificial or fresh flowers. This hairstyle for the wedding is especially suitable if you are having a barn wedding. Just don`t forget to use some bobby pins and light hair spray to hold those loose curls together. If you want to go simple for the wedding day, a delicate hair accessory like a strass or pearl headband can add that much-needed charm to your look. Bob length hair, partially tied back looks pretty elegant and modern. Piece out the dainty face-framing locks and tie back the remaining hair into two twisted knots to get this hairstyle. The classic hairdo has been given a modern outlook with the touch of messiness. One of the swish wedding updos for short hair, this style leaves some pretty locks that caress your face. Flaunt your fashion sense by wearing a crop top wedding attire, paired with a long flowing skirt. One of the whimsical hairstyles for wedding, an airy, spontaneous updo, is ravishing to look at. Just tease the roots, twist and pin your hair – the simple updo is really sensational. A dress with a dipped V-neckline and metallic finish or a lace gown will absolutely go with this exceptional hairdo. Do not forget to pin a beautiful accessory to complete your bridal look. Brides with vintage hairdos get an extra dose of femininity for free. The soft vintage curls are what a bride with short bob hair may look for. Curls are wrapped in alternate directions to accomplish the cute style inspired by the 20’s. Pair with an unusual and eye-catching hair piece that you can pin to a headband or simply to the side of your bridal hair. When it comes to wedding hairstyles for short hair, many brides and bridesmaids might think there aren’t a whole lot of options available to them. Fortunately, this isn’t the case. There are plenty of great styles to choose from, including this curly ‘do that is twisted and held up in place with hairpins. Add some flowers or jewels to fancy it up further. To make short length hair appear longer, go with a braided style. The intricacies of the braid add volume and depth to an otherwise flat and fine style. With the assistance of a strong hold hairspray and some strategically placed pins, you will be able to wear this style through dinner and dancing without any issue. To accomplish a bun with short hair, you just need to be a little creative. For this updo, tease the roots, brush hair straight back and then loosely gather sections, curling each one downward around a finger and then pin in place. Braiding literal bows into the hair has been very popular in recent years. A braid that doesn’t look like a braid, but rather as a fancy weave with bows and messy loops will bring your braided updo to the peak level of creativity. How can you make a hair bow? You can make a ponytail loop and pull on both ends before the final pull through. Next wrap a thin piece of hair around the center to cover the elastic and secure with a hairpin. 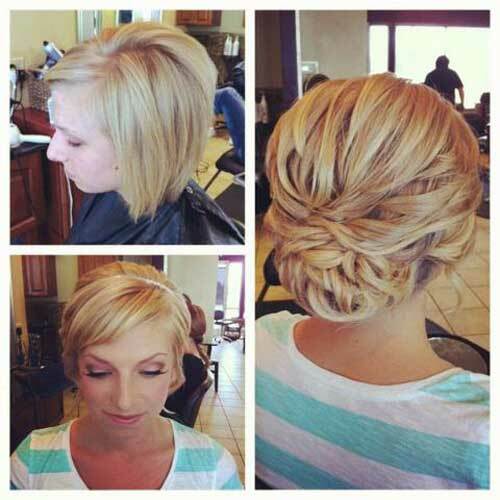 Short wedding hair can be gorgeous too, this hairstyle proves it! With shaved sides and a wonderfully curly top, this hairstyle is short enough, and it doesn’t leave a lot of room for creativity. But never fear – just curl your hair if it’s naturally straight and then add in an embellished hair clip to the side to make things formal and still fun. Girls with naturally curly hair have plenty of advantages when it comes to gorgeous styles – but growing your hair long is a challenge. Curly hair grows at the same pace as straight locks, but due to the coils it takes much longer for it to “fall” to a longer length. Instead of pulling and straightening, just let your hair go natural with all of its different sized curls, bends and sprouts. For a wedding, not only will this look be unique, it will also be flattering because it’s who you naturally are. Curl your short hair into spiraled waves using a medium barrel curling iron. Curl hair back and outward, then secure each section with a pin on the side and underneath. Spray with a finishing spray. To master wedding hairstyles for short hair, stylists often use this trick to thicken up strands and keep things both simple and lovely. Brush hair back and then backcomb it further with a hair pick or wide toothed comb. Don’t over style – just go where the sections lay, finger combing them into place and pinning them. Add a strong hairspray for all-day hold and lace a back section with a delicate accessory, a piece of baby’s breath or another kind of small, subtle flower. When using headbands for short hair, you are adding a vintage touch to your bridal look. Pull the hairband across the forehead and blend it with veil, bow or any other accessory you wear down the aisle. Channel your inner Princess Elsa with this platinum blonde side braid that has been reimagined for short hair. Short hairstyles for weddings should certainly be very feminine, like this updo that is created simply by backcombing hair, loosely French braiding it to the side and securing in place. Do you love all of the curly, fancy wedding hair ideas you’ve seen, but really just want something simple? Keep hair straight, sleek and elegant with the addition of one of several hairpieces available. On the other hand, go big or go home with chunky curls and an overstated hair embellishment that looks amazing on a bride or a guest of a wedding party. The more sparkle the better if the wedding is formal or the bride has a fun personality. Basket weave your shoulder length strands into a wedding hairstyle that is both beautiful and intricate. Wedding updos for short hair are often put in place by a stylist so that everyone looks their best without a lot of wasted time or energy. Consider treating your wedding attendants to a morning at the salon. For hair that’s shoulder length, the selection of bridal hairstyles expands greatly. If you are fortunate to have shoulder length straight hair, try this style that’s not only perfect for weddings, but every day wear too. Blondes do have more fun, and that’s never been truer than with this wedding hairstyle that replicates Marilyn Monroe’s famous coif. Large hair rollers will get this hairdo looking fabulous in no time. Wedding hairdos are not always tightly curled or strongly sprayed – sometimes the best looks come from a place of nature and relaxation. Finger comb hair into place, secure with some hairpins and add an accent of tropical greenery for this earthy look. Short wedding hairstyles are gaining popularity thanks to this tousled, manageable trend. Add a boost of volume by backcombing the underlayer of hair and then brushing the top layer back and to the side. Hairstyles for wedding attendants can really be this simple! Short hair needs a capable professional when it comes to bride hairstyles. Complete a trial at the salon for complex retro curls like these ones. Goldilocks would be envious if she saw this beautiful example of short hair wedding styles. Curl large sections of hair and pin while the curl is still in place. Hairstyles for weddings don’t need to be complicated – instead, keep things simple yet lovely with this pulled back style for short hair that allows freedom for curls and tendrils throughout. If you are craving to make a bun with your short hair, choose the conventional mid-bun. Short wedding hairstyles like this may have a flawless front bump that every bride will admire. Have you bought a trendy lace gown for your wedding? Well, then this updo can be the perfect match. If you are already sporting a short Bob and planning to exchange vows in a few weeks, you can have a very lovely short hair wedding style even with your super short length. Allow the wide curls to rest along one side of your face and make neat braids on the opposite side. A long flowing wedding dress or a mini bridal dress will look best with this bold bridal bob. Gently curled short locks have that vintage inspired conventional aura. Hair spray is used in abundance to set this 40’s pin-up curly hairstyle. Manifest the dramatic ethos of a retro bride by wearing a princess bridal gown with this elegant hairdo. An updo for the short hair bride won’t be very voluminous, but it still can embrace any trendy texture – messy, crimped, beach waves, etc. Try a bridal dress that has a Victorian touch with this ‘do, and your wedding style will be worth remembering. To achieve the ceremonial look, graceful hair accessories should be used for added flair. A bride with shorter ombre hair should take advantage of her hair color and opt for an updo where the lighter ends are styled into a lacy bun or a hair flower. Go for a sleek updo or tease the roots for mega root volume. Refrain from the intricate hairdos for your wedding day. A lace flower with pearls pinned to your short hair can just add the oomph to those messy curls. Sporting this short hairstyle for the wedding, a bride can be totally at ease at her wedding party – the curls will hold with a few pins and a bit of hairspray. Brides experimenting with hair colors are redefining wedding hairstyles for short hair. The soft lavender hair has a tinge of silver color that complements the charismatic hairstyle. You may want to add fresh flowers or appropriate hair accessories to your bridal hairdo. In this case just stick a sprig of baby’s breath under your fishtail braids. If you are planning to wear a bridal outfit in Boho style for your wedding, then this neat hair affair will complete your wedding look just perfectly. A flower crown will make you feel no less than a princess. Even a bride with short hair can wear her favorite flowers as a tiara for the wedding day. The messy fishtail takes care of the long curly bangs that would otherwise fall into the face. Be a gorgeous Boho bride exploring the manifold ideas of this popular trend! Recreate the fashion of the by-gone times when brides preferred sassy hairdos. The fine pin-ups of the delicate twists or rolls will make for a laudable updo hairstyle for the wedding day. Wear this dapper updo with your gala bridal outfit and let your groom fall in love with you all over again. Experienced stylists can create magical updo hairstyles for weddings even with shorter hair. This lovely ‘do features a gorgeous lift at the roots and soft voluminous curls covering the crown and the back of this cute head. This simple laid back hairstyle with a dash of romance is currently in the mainstream. Here it’s also complemented with a set of refined hair jewelry. Who knew you could make a fancy updo like this out of a short bob? This impressive loose wedding hairstyle is on-trend in 2019. The idea is to select a piece of hair jewelry that compliments the finish of your hairstyle. This lacy headband works perfectly for the thin delicate waves and brightens the model’s eyes. Fresh flowers for hair accentuate the beauty of your skin and make any simple wedding hairstyle luxurious, whether it’s a weave or flat ironed hair. Romantic wedding updos for short hair are being the most popular among the modern brides. Any girl feels extremely feminine and attractive wearing a hairstyle like this. To bring the idea to life, you would apply light styling mousse to your damp locks and blow dry them with a lift at the roots to boost their volume. Slightly backcomb the bangs and pin them back. Shape the hairstyle and fix it with bobby pins of the matching color. Complete the look with a stylish accent – a large hair flower. We wish you the most fantastic moments on your wedding day, the most beautiful wedding photos and the happiest years of marriage life!